There is a point near the end of Sage Theatre's production of Jack Goes Boating, where I found myself gripped with fear, terrified of the savage violence that I was almost certain was imminent. I have never before been quite so rattled with anticipation during a play. The fact that the volatile situation happens off-stage speaks volumes about the power that this production wields in drawing the audience into the world of four damaged, but ultimately hopeful, characters. 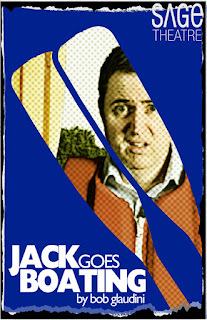 Strangely, Jack Goes Boating is actually a comedy. A romantic comedy, at that. Written by Bob Glaudini, Jack Goes Boating was first produced as a small, but critically acclaimed, New York play, which gained a wider audience and near-cult status when adapted for cinema under the direction of one of its actors, Philip Seymour Hoffman. Jack Goes Boating tells the story of four working class friends who struggle to find meaning in their relationships. Clyde and Lucy are a long married couple, whose marriage is slowly unraveling. Jack, Clyde's long-time friend, is a gentle, rather befuddled, ungainly giant with an unnatural fondness for Boney M. Connie, Lucy's new coworker, is an emotionally fragile woman, who talks incessantly when she is nervous. Clearly she is often nervous. The awkward couple are set up on a date by their friends, after which they embark on a slow and cautious dance of letting go of fear and inviting trust, while their married friends let go of trust and invite fear. The play begins as a series of vignettes - brief flashes of action - which gradually coalesce into increasingly extracted and meaningful exchanges. Along the way, Jack, Connie, Clyde and Lucy emerge as delicately nuanced personalities, who ache and bleed and love and betray. The Sage Theatre production (which is co-produced with Edmonton's Shadow Theatre) uses a sparse stage setting of nine cubes which are tetrised between scenes to transform the stage from a living room to an office to a hospital room to a swimming pool. The swimming pool, the metaphorical epicentre of the play, functions as a both a physical setting and an emotional one. It is both the setting of actual swimming lessons, doled out with delightfully militaristic barking, and an internal monologue, delivered with desperate intensity. Jack Goes Boating may be a romantic comedy, but the lovers are not the sort who resolve their problems to live happily ever after in 90 minutes. They are flawed and capable of great cruelty, while being simultaneously gentle and painfully hopeful. The two couples you will meet in Sage Theatre's production will remain in your consciousness for a long time. Almost as long as this song will. I don't prefer that song...so is that a good thing or a bad thing...? It's neither, ReBelle. It's recurring theme within the play, but it takes nothing away from the performances.